← The Space Age Dinner? That’s a song from the Thomas the Tank Engine masterworks series. My son sings it every morning while I convince him that it’s time to get dressed and get going. I’m not sure that he is unaware of the sarcasm, even at the tender age of two and a half. I bring that up as it is an errand day. I am trying to get a lot done (explaining away the hastily shot picture) so that I can poke my nose outside and take the air a bit as I contemplate what makes for everyday elegance — or elegance, everyday. I must refill prescriptions, eye a CD or two, buy a book and visit the supermarket. If I’ve time, I will have the car cleaned since the dog got sick in it this morning. Come to think of it, that little chore just took precedence over the stop at Barnes and Noble. If I’m focused enough to finish everything today, I will have time on Thursday to visit the Saarinen exhibit at the Virginia Center for Architecture, housed in the former Branch mansion. I’ve never quite “got” his furniture, plastic…, but I loved Dullus Airport, even as a small child (lots of reasons… adventure, sophistication, that whole Jet Set zeitgeist that our children will miss out on.) I hope to educate my eye and gain a better appreciation for the rest of his work. So what’s that got to do with the photo above? Not much. Clothing for dashing about, in and out, home and away. 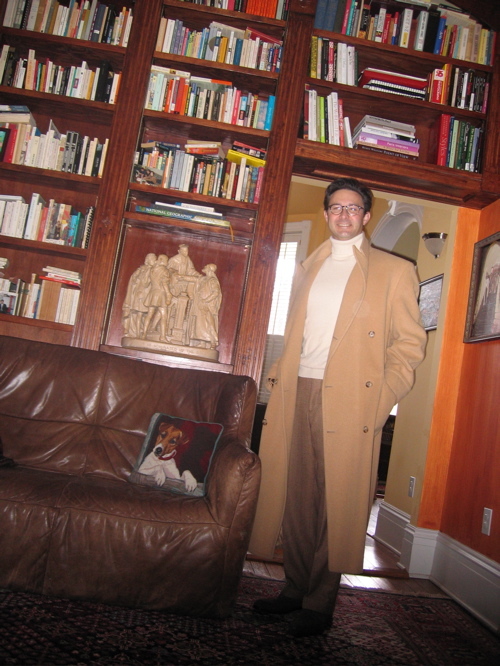 Michael Kors cashmere turtleneck, Boss tweed trousers in brown and cream herringbone, Cole Haan/Nike suede brogues and the ubiquitous polo coat. Shame you can’t see the argyle socks. Just because I’m busy doesn’t mean that I don’t take the time to dress a little better than I have to. Not all situations require a suit and tie. Neither do they all require jeans and a t-shirt. Just the little bit of extra effort. This entry was posted in Elegantology and tagged Branch House, Dullus Airport, Eero Saarinen, Town and Country. Bookmark the permalink. Correction, the trousers are Hickey Freeman. I was wearing a nice wool skirt, cashmere sweater and heels yesterday and ran into a friend. She asked if I always dressed up that much (!) for work. I replied “of course I do!”. Why wouldn’t I dress for work… my boss does, so I do. But that’s not the only reason. Smashing as always, and I am a little ashamed as I sit here prinitng out my annual Christmas Eve party invitiations in my jeans and UGGs, and contemplate having to go out of the house to deliver a daughter to her violin lesson. I promise you that I do dress up for work however. Correction: Don’t you mean “Dulles Airport”?? The idea of championing Elegance is a noble one. Even if we’re broke, we can still try for some kind of elegance – to raise our spirits if nothing else. Lots o’luck to you. I do think, however, that genuine Elegance comes very naturally and is never self-consciously drawing attention to itself. Assuming an aura of “elegance”, one always risks becoming merely a poseur. Living in Los Angeles, I’ve seen many naturally elegant men wearing mere jeans and tee shirts; no labels but Levis. T’is the season for whirling one into a frenzy, may as well do it looking easy and elegant. Never settle for less, that is why I stop here and get my “infusion”- off for a busy day, so busy. I love his dining table and always wanted it in black with a marble top. In Buffalo, where I grew up, the Saarinens (father and son) designed the symphony hall with acoustics that are among the best in the world. My high school and college graduation ceremonies were both held there. And I have fond memories of many concerts and ballet performances I saw. They even had a few heavy-duty rock concerts until they decided we were too rowdy a crowd. Thus I got to see The Who perform “Tommy” in an acoustically perfect hall (to say nothing of Joe Cocker, Leon Russell and Mad Dogs and Englishmen). Thank you Bevglen, as you can tell I was in too much of a rush to even proofread. I’ll agree that elegance is an internal “virtue” that is expressed in the ways that we carry ourselves, dress, speak and behave. I also firmly believe that it can be acquired, internalized and lived (for lack of a better term.) I’d rather not assume an aura of elegance so much as exude an easy elegance in everyday situations. Jeans and t-shirts have their place — Mr. Armani is very elegant in them. However, I don’t believe that they should constitute the whole of a person’s wardrobe. In my experience an extreme level of informality in dress often results in a lack of “correct” deportment, by which I mean a social politesse. I don’t think we need to go Victorian with this thing. I do not advocate a return to cutaways and strollers for business wear. Just some simple reminders to say “please,” thank you” and to continue dressing like an adult instead of a teenager. Perhaps I am mistaken, but we all have to stand for something. I’ll start here. Mrs. PvE, the whirlwind of the season must be why it is always tinged with swirling snowflakes and glittering lights in my memories if not in reality. ELW, no kidding? I’m very much looking forward to sneaking out to the exhibit tomorrow. I adore the coat, as always. And, the Town and Country spread was wonderful, wasn’t it? I am also so pleased to see your thank you note post. So vital in this “new” age.